In a previous article, we considered many reasons why the Old Testament is preserved more accurately in the Septuagint than in the Masoretic Text. Today, we consider yet another example. When the apostle Paul read the Psalms, did he read the Septuagint, or the Masoretic Text? Did he read the Psalms in Greek, or in Hebrew? To answer this question, consider the way St. Paul quotes from Psalms in the book of Romans. They are all gone out of the way, they are together become good for nothing, there is none that does good, no not one. Their throat is an open sepulchre; with their tongues they have used deceit; the poison of asps is under their lips: whose mouth is full of cursing and bitterness; their feet are swift to shed blood: destruction and misery are in their ways; and the way of peace they have not known: there is no fear of God before their eyes. Which version of the Psalms do you think Paul was using, the Masoretic Text, or the Septuagint? If Paul had been relying upon the Masoretic Text, he would have had to cobble together fragments from six separate passages: Psalm 14:1-3, Psalm 5:9, Psalm 140:3, Psalm 10:7, Isaiah 59:7-9, and Psalm 36:1. It would be quite a coincidence if Paul–using the Masoretic Text alone–would have brought these six separate quotations together, in exactly the same order as they appear in one single passage in the Septuagint. Of course, if Paul was relying on the Septuagint, then all he had to do was quote from Psalm 14 and his job was done. Simple. The most sensible explanation is that Paul was quoting from the Septuagint in the third chapter of Romans. He was relying on the Greek version of the Old Testament, not the Hebrew. The Orthodox Study Bible is faithful to the Septuagint translation of Scripture, the same translation used by Jesus and the Apostles. The oldest existing copy of the Masoretic Text only dates back to the 10th century. The Septuagint, on the other hand, was translated over 1000 years earlier than that. During New Testament times, Jesus and the Apostles quoted from this Greek translation frequently, and with full authority. Here is a sample of the differences between the Masoretic Text and the Septuagint. While many Protestant bibles rely heavily on the Masoretic Text, the Orthodox Church has continued to use the Septuagint for the past 2000 years. 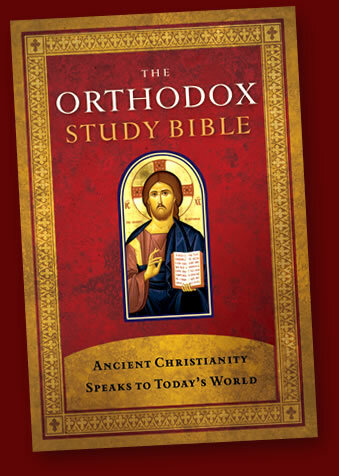 The Orthodox Study Bible is an English copy of the Scriptures, and its Old Testament is translated from the Septuagint. It is very good, and comes highly recommended! This entry was posted in LXX - Psalm 14:3, Masoretic Text, Psalm 14:3, Romans 3:12-18, Septuagint. Bookmark the permalink. I know this is an old post, but I have a question. Your example here with Rom 3 and LXX Ps 13 cannot sustain your argument because the LXX 13:3 (14:3) text is bracketed, most likely because it is deemed a later Christian interpolation–i.e., someone adding the Romans 3 text into the LXX psalm. That’s the reason the verse is so long–it’s Paul all along. Can you offer another example like this where it obvious Paul was strictly reading the LXX and ignoring the MT? You are assuming that someone added the Romans 3 text into the LXX Psalm, but the evidence does not show this. However, even if that were true, we would still have plenty of evidence that St. Paul favored the LXX over the Masoretic Text. Rom. 3:10–12 is a citation of Ps. 13:1–3 according to the LXX (disagrees with the MT in part), and is also repeated in Ps. 52:2–4 LXX (and is similar to Eccl. 7:20). Rom. 3:13 is also a citation of Ps. 5:10 LXX and Ps. 139:4 LXX, both disagreeing with the MT (e.g. “spiders’” poison vs. vipers’). Rom. 3:14 is a reference to Ps. 9:28 LXX. Rom. 3:15–17 is also a citation of Isa. 59:7–8. Rom. 3:18 is a citation of Ps. 35:2 LXX. So even if one were to grant that Psalm 13/14 was later amended in the recension of St. Luke of Antioch, this doesn’t undermine either its place as part of Tradition or the preference for the LXX among the apostles and early Church fathers. Many thanks to Gabe Martini for the above observations. Almost very time I run across this argument, there is a lot of emotion involved. Wish that wasn’t the case, but since it is, we find a lot of contorted logic to try to prove authenticity one way or the other. Did Paul quote from the LXX? Almost certainly. But I’ve never seen what I consider to be the most compelling argument, and what settled the matter for me. Look what Paul wrote to the Romans: “For whatever was written in former days was written for our instruction, that through endurance and through the encouragement of the Scriptures we might have hope.” (Rom. 15:4, ESV). And what did he write to Timothy? “All Scripture is breathed out by God and profitable for teaching, for reproof, for correction, and for training in righteousness,…” (2 Tim 3:16). The question arises, what is this “Scripture” he’s talking about? He is writing to gentiles here. (At least I think Timothy was a gentile; it doesn’t sound like a Hebrew name.) And to ANY gentile of the age, and probably to a good proportion of Hebrews at the time, “Scripture” would refer to the LXX. That was THE “Bible” of the first century. Either of those audiences would take the LXX to be what he was referring to. Now Paul was a pretty bright guy, and if he had meant “whatever” and “all” to exclude what we now call the deuterocanonical books, he would have made that point. “All Scripture (except that pesky Apocrypha, of course) is breathed out by God.” He didn’t do that. God is a pretty bright guy, too. If He inspired all Scripture, including, 2 Tim. 3:16, I’m sure He wouldn’t have missed that detail. I was just looking into this earlier today, I wanted to know if St. Paul or any of the NT letters make reference to what would have been in the Septuagint in particular and I found this one; Hebrews 11:35 and 2 Macabees 7 (you’ll have to read all of Ch 7) to understand the comment that’s made in Hebrews.